We’ve seen too many lives lost to senseless gun violence. Last week, ten people were killed and more injured in a shooting at Santa Fe High School outside of Houston -- just three months after a mass shooting at a high school in Parkland, Florida intensified the national debate over gun reform and seven months since another mass shooting in Texas took the lives of 26 people. Though Governor Greg Abbott has begun the process of convening round table discussions on how to address gun violence in Texas, we know that discussions are not enough -- action is needed immediately to prevent these mass tragedies and gun deaths. Click here to take action and demand gun reform now. 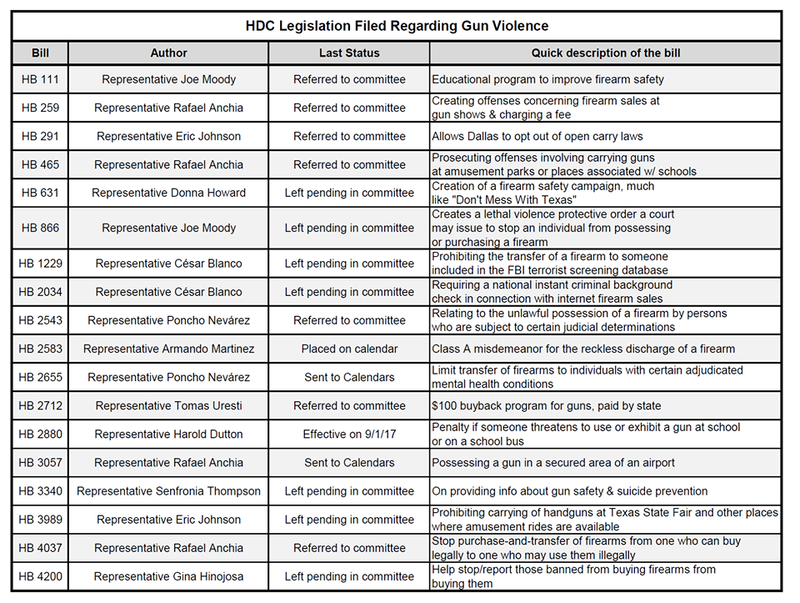 Ahead of Abbott’s meeting the House Democratic Caucus pointed to at least 18 bills Democratic members of the Texas House filed in the 2017 legislative session. Of the 18, only one -- regarding the penalty if a student threatens to use a gun at school -- passed. The common sense, life-saving gun reforms proposed by House Democrats include measures that require background checks, create robust gun safety programs, and prevent dangerous and extreme risk people from arming themselves.